Tissue morphogenesis: Embryo development is typified by a tremendous amount of cell movement. 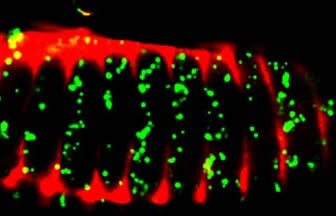 How do the cells in fruit fly (Drosophila) embryos change their shape to drive tissue morphogeneis? Programmed cell death: Programmed cell death (apoptosis) plays a central role in embryonic development. How do cells decide to die to maintain tissue homostasis?